Douglas Crockford famously declared browsers to be “the most hostile software engineering environment imaginable,” and that wasn’t hyperbole. Ensuring that our websites work across a myriad of different devices, screen sizes and browsers our users depend on to access the web is a tall order, but it’s necessary. If our websites don’t enable users to accomplish the key tasks they come to do, we’ve failed them. We should do everything in our power to ensure our websites function under even the harshest of scenarios, but at the same, we can’t expect our users to have the exact same experience in every browser, on every device. Consider the EU’s “cookie law.” If you’re unfamiliar, this somewhat contentious law is privacy legislation that requires websites to obtain consent from visitors before storing or retrieving information from their device. 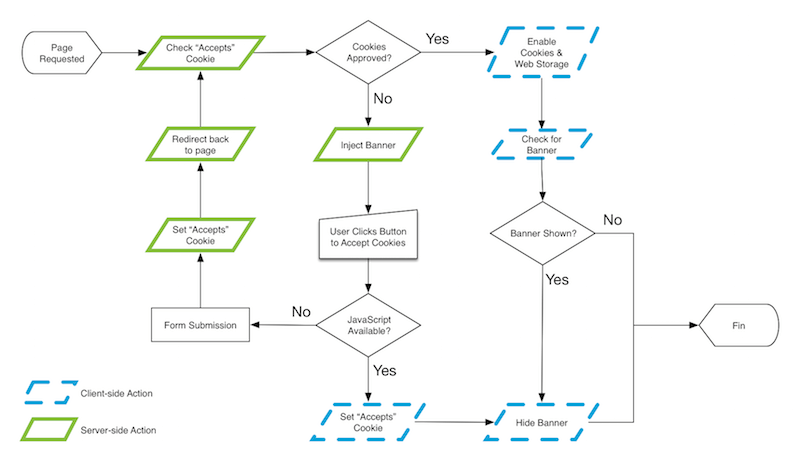 We call it the cookie law, but the legislation also applies to web storage, IndexedDB and other client-side data storage and retrieval APIs. I’m a big fan of using interface experience (IX) maps to diagram functionality. I find their simple nature easy to understand and to tweak as I increase the fidelity of an experience. 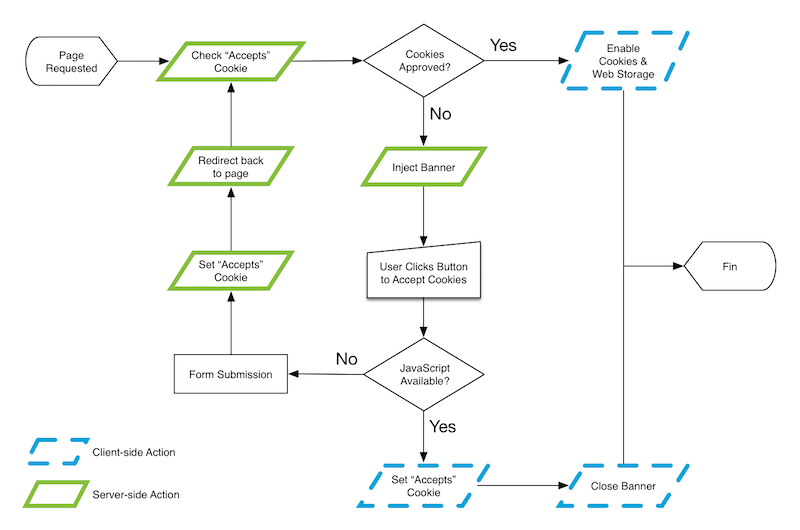 For this feature, I started with a (relatively) simple IX map that diagrammed what would happen when a user requests a page on the website. Speaking of mitigating networking issues, the 10k Apart contest website uses a service worker to do some pretty aggressive caching; the service worker intercepts any page request and supplies a cached version if one exists. That could result in users getting a copy of the page with the banner still in it, even if they’ve already agreed to allow cookies. Time to update the IX map. 10k Apart’s back end is written in Node.js and uses Express. I’m not going to get into the nitty-gritty of our installation and configuration, but I do want to talk about how I implemented this feature. First off, I opted to use Express’ cookie-parser middleware to let me get and set the cookie. This template uses an inverted section that only renders the div when approves_cookies is false. Within that markup, you can also see the current_url getting piped into a hidden input to indicate where a user should be redirected if the form method of setting the cookie is used. You remembered: the fallback. This function takes a single optional argument. If true (or anything “truthy”) is passed in, the banner is immediately removed from the page (and its reference is deleted). If no argument is passed in, that doesn’t happen for 0.6 seconds, which is 0.1 seconds after the animation finishes up (we’ll get to the animation momentarily). The class change triggers that animation. A video showing the browser viewport being enlarged from 240 to 960 pixels width. When the design hits the 60-em breakpoint, the banner becomes fixed-positioned. Not knowing how tall the banner would be (this is responsive design, after all), I needed it to animate to and from a height of auto. Thankfully, Nikita Vasilyev published a fantastic overview of how to transition values to and from auto a few years back. In short, animate max-height instead. The only thing to keep in mind is that the size of the non-zero max-height value you are transitioning to and from needs to be larger than your max, and it will also directly affect the speed of the animation. I found 20 ems to be more than adequate for this use case, but your project may require a different value. It’s worth noting that I am setting the top margin on every element but the first one, using Heydon Pickering’s clever “lobotomized owl” selector. So, the transition of margin-top on .banner will be from a specific value (in my case, 1.375 rem) to 0. With this code in place, the top margin will collapse over the same duration as the one used for the closing animation of the cookie banner and will be triggered by the very same class addition. Front page image credit: Pexels.